On folio 98r of Manuscript B, Leonardo drew a warship called the Scorpion because of its resemblance to the arachnid. 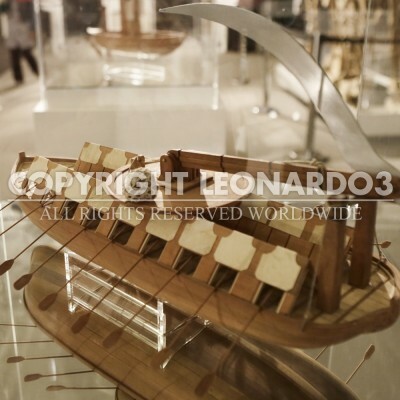 Leonardo studied ancient ships and was inspired by the scorpion’s fatal hook-like stinger. An enormous mechanical scythe placed in the center is activated by a large weight that, once thrown into the sea, triggers the movement. This scythe should be able to inflict considerable damage and the circular platform on which it rests allows it to rotate 360 degrees and attack from any direction. 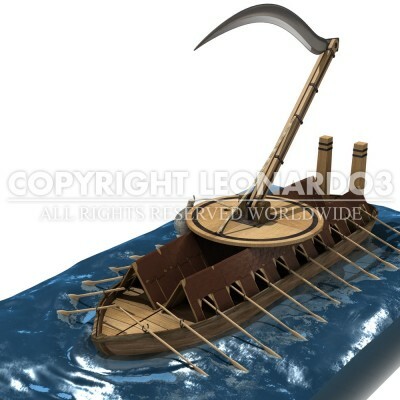 The ship is equipped with several oars to make it fast and there are no sails, which would hinder the action during the attacks. Beneath the scythe are two useful wedge-shaped structures to protect the sailors from attacks coming from above. These shields are covered in moist hides to protect against the shots of incendiary weapons.